Credit Score Requirement: A 640 credit score or an establishment of three alternative credit trade lines is required. However, JustChoice Lending works with applicants to help them raise their credit scores to acceptable levels. Term: Loans are for up to 33 years (38 for those with incomes below 60 percent of AMI and who cannot afford 33-year terms). The term is 30 years for manufactured homes. The USDA 502 Direct Loan Program assists low and very low-income applicants in obtaining safe, affordable housing in rural areas. Payment assistance is available to those who qualify. Applicants may obtain 100% financing to purchase an existing home, purchase a site and construct a home, or purchase a newly constructed home located in a rural area. Mortgage payments are based on the household’s adjusted income. 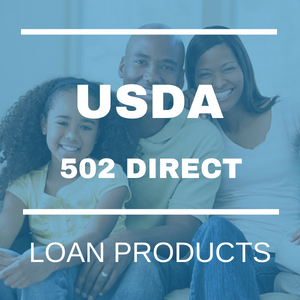 Applicants for 502 Direct Loans must have low- or very low- incomes and live in a rural area. Contact a member of JustChoiceLending for specific income information Families must be without adequate housing, but be able to afford the mortgage payments, including taxes and insurance, which are typically within 22 to 26 percent of an applicant’s income. Under the Section 502 program, housing must be modest in size, design, and cost. To be considered modest housing for an area, the home should not have market value in excess of the applicable area loan limit, and should not have certain prohibited features.